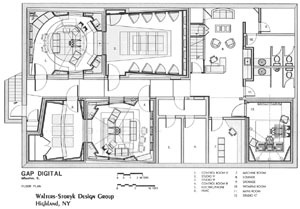 At times jokingly referred to as the best kept secret in DuPage County, GAP Digital is home to a studio complex designed by world renowned studio architect John Storyk. A press release issued during the renovation provides a good overview of the project. 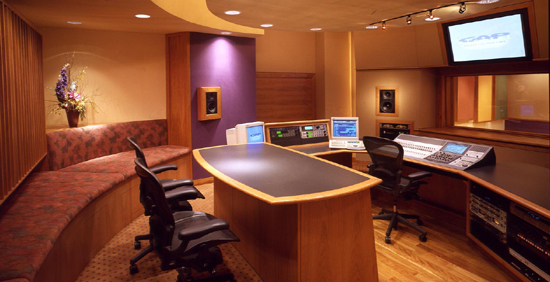 Walters-Storyk Design Group was the architech of choice for the renovation of a three-studio complex for GAP Digital, one of the only U.S. recording studios specializing in the production of long-form audio drama. The 3000 square-foot facility is located in the Chicago suburb of Wheaton. In addition to completely refurbishing Studio A, which measures 420 square-feet, and 225 square-foot Studio B with it's Foley stage, WSDG has converted a small office into a third room, Studio C, which features network access to all resouces available in the other two rooms. "Our goal is to provide clients with a multipurpose, 5.1-capable facility, that supports radio, audio-for-video, music,... the whole gamut of audio projects, in a visually stimulating environment," comments owner Todd Busteed. Each studio is equipped with a Fairlight MFX3Plus digital audio workstation on a Medialink network and a ProTools system. Studios A and C each house a Sony DMX-R100 digital console. A centrally located machine room networks virtually all resources in the complex and the entire facility is serviced by a 6 kva uninterrupted power supply. Sound isolation was a particular challenge in the restoration. GAP Digital is located less than 100 feet away from a major train line. "Fortunately," says WSDG principal architect John Storyk, " the building has a foot-thick concrete foundation. For increased isolation, we floated the floors to insulate the rooms from the rest of the building, and redesigned the HVAC system so that the unit operates more quietly and efficiently." "We retained WSDG because of their reputation. Of all the rooms we have seen over the years, John Storyk's work has consistently been the most aesthetically appealing. 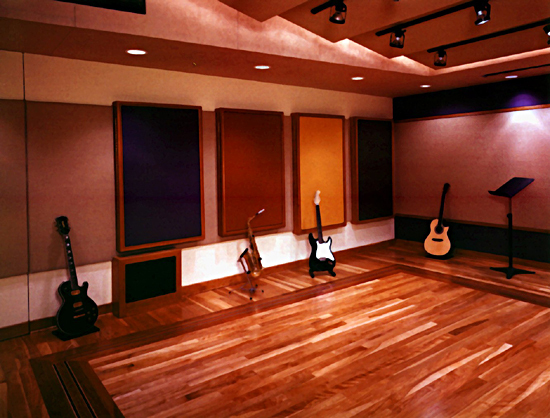 Visually, WSDG really transformed the studios. The process of bare steel and concrete to a production work space filled with striking colors involved lots of angular stretch fabric, ceiling clouds, wall panels, and hardwood floors. Radio drama is one of our specialties, so there is a constant flow of clients and actors coming in and out of our doors. We want the atmosphere here to stimulate the imagination." In business since 1980, GAP Digital has created scores of radio dramas, including programs based on such classic stories as Victor Hugo's Les Miserables, C. S. Lewis' Chronicles of Narnia, and George Eliot's Silas Marner. The facility recently finished producing 144 half-hour episodes of a drama series titled Left Behind, based on the best-selling book series of the same name. Left Behind is being broadcast on over 700 radio stations.